Rep. Bobby Rush said President Donald Trump agreed to visit Chicago before delivering his first speech to a joint session of Congress on Tuesday, the Chicago Sun-Times reports. “The legislator said the nation’s chief executive agreed to visit the city, which has been under a national spotlight after Trump threatened to ‘send in the feds’ to curb violence,” Rush’s office told the Sun-Times. Trump reportedly agreed to visit the city after Rush caught the president moments before his address to Congress. A White House spokesperson could not confirm the trip. During Tuesday's speech, Trump once again pointed to Chicago’s surging violence. “In Chicago, more than 4,000 people were shot last year alone — and the murder rate so far this year has been even higher,” Trump said. Chicago saw 103 homicides in the first two months of 2017. Last year, there were 102 killings in the same time period, according to the Chicago Tribune. Rush’s office reportedly disputed Trump’s claim, saying the president "assailed Chicago’s shooting rate by erroneously stating the current [year] had already surpassed last year’s numbers." Mayor Rahm Emanuel urged the president last month to supply the city with additional federal resources to quell the ongoing violence. “Just send them,” Emanuel told reporters. “Send more FBI, DEA, ATF agents. We don’t have to talk about it anymore." Weeks later, Emanuel met in Washington with members of Trump’s senior staff to discuss how the federal government can help address the city’s violence. During the trip, Emanuel also discussed Chicago’s violent crime with Attorney General Jeff Sessions. Gov. Bruce Rauner was noticeably absent Monday as Trump highlighted the situation in Chicago during a White House speech to the nation’s other 49 governors. 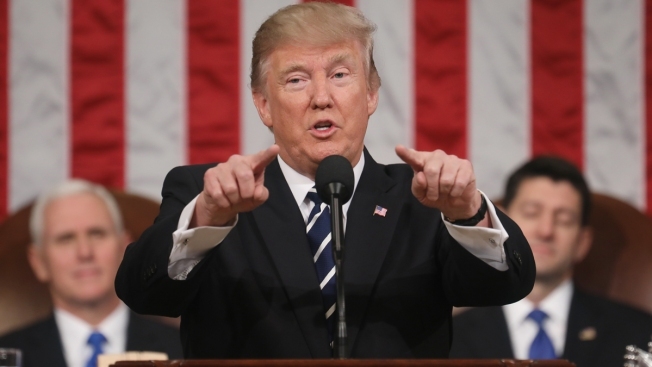 Ahead of his first speech to Congress Tuesday, Trump vowed to increase federal spending to “fight violent crime” in the country.